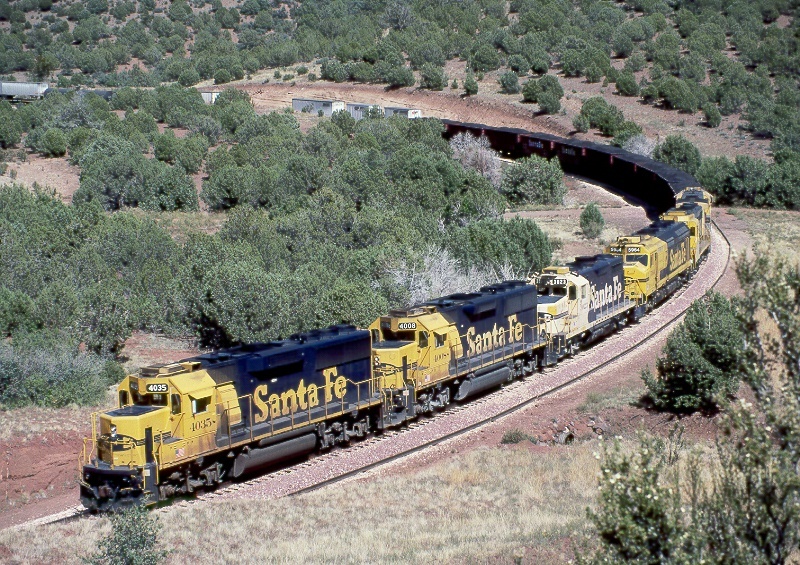 The Santa Fe (which is now the BNSF) has a high speed double track mainline running across northern Arizona, with a wide variety of scenery from near sea level at Topock on the Colorado River to the altitude of 7335 ft at the Arizona Divide, just west of Flagstaff. One can get trains in 120 degree heat to well below zero! 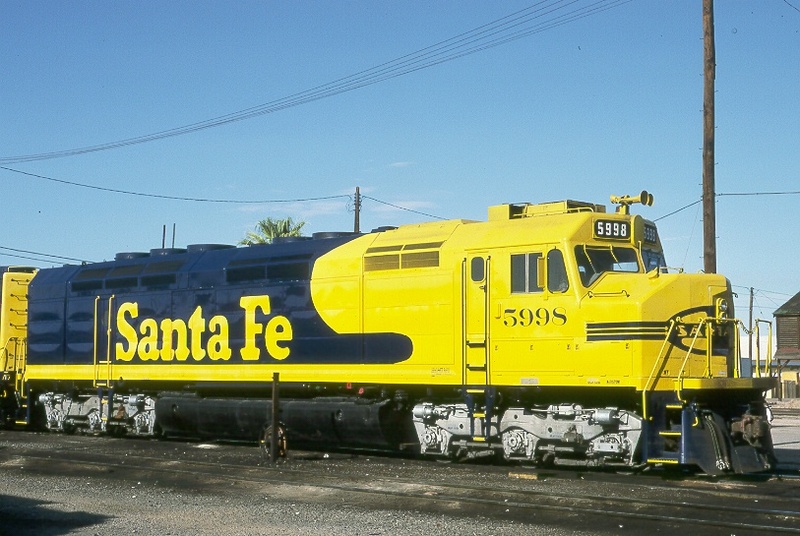 One of the first GP30's to be painted in the "Kodachrome" colors is shown here at Mobest (Phoenix) yard on July 6, 1986. 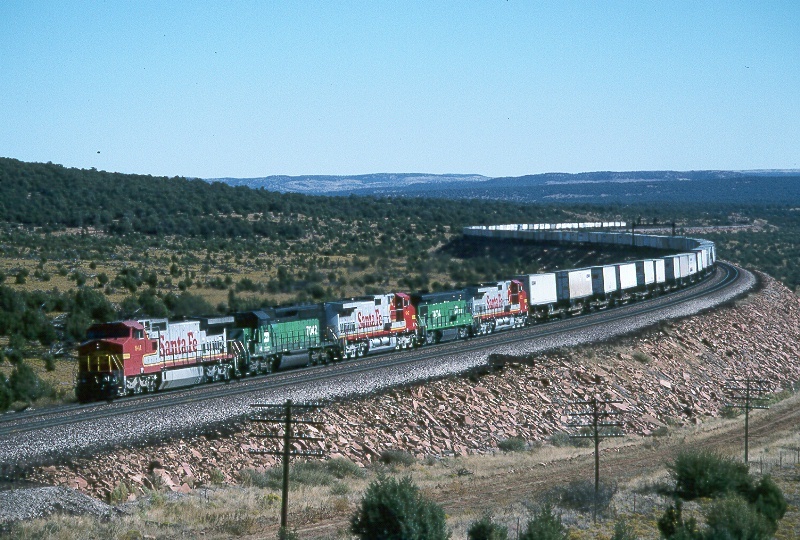 This westbound train is setting off a few cars for the Apache Railway at Holbrook on Sept. 20, 1986. They are reaching from the south main across the north main into a house track on the north side of the main line. 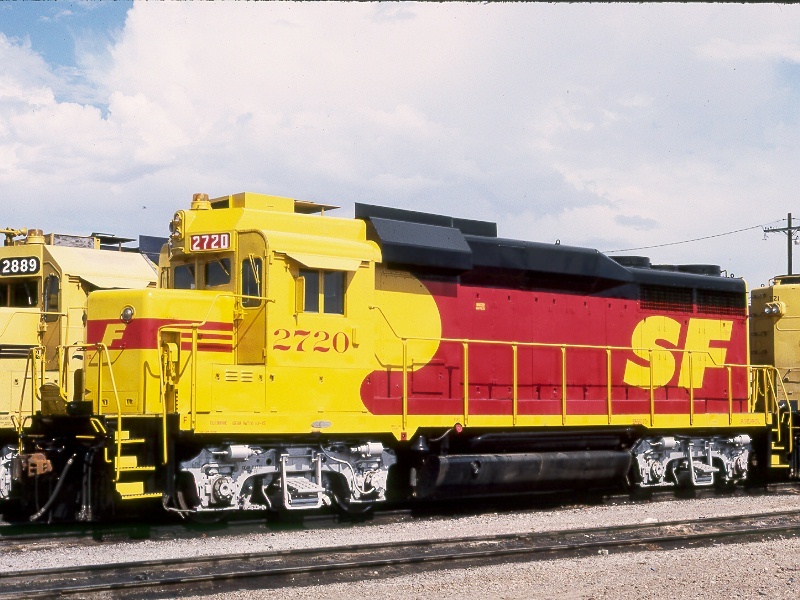 Here is a freshly painted FP45 early in the morning at Mobest on Aug. 2, 1987. 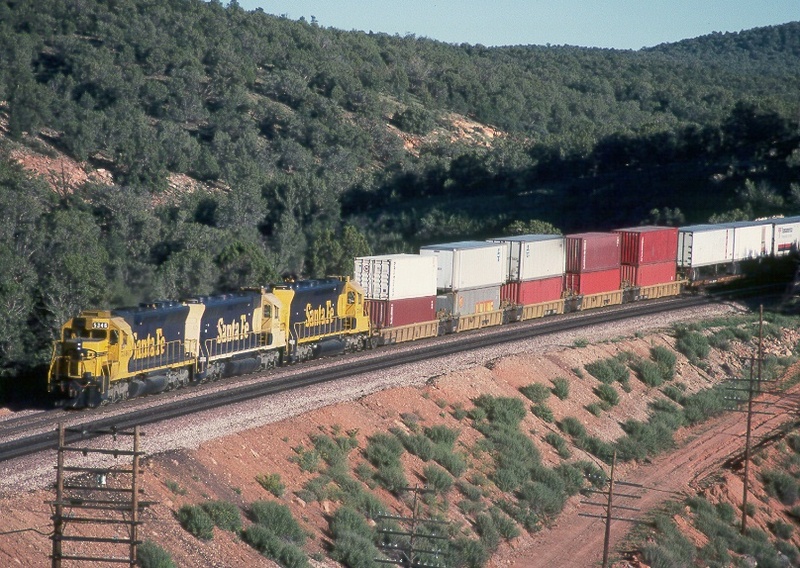 This is a Shipper's Special headed west near Glendale on June 13, 1989. 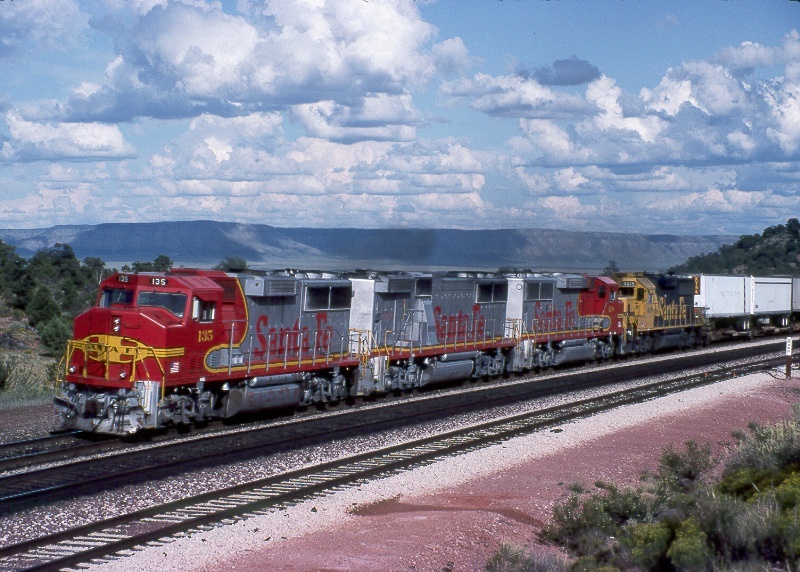 Here are 2 of the recently renumbered FP45's headed north on the Grand Canyon Ry. 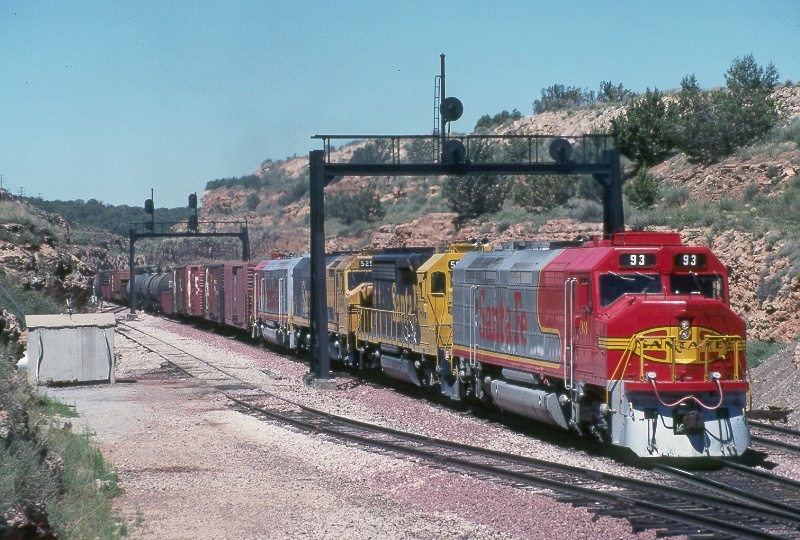 under the I-40 overpass on April 4, 1990 on a special train to the Grand Canyon from Phoenix. Little did I know at the time I took this photo that this would be a sign of things to come! 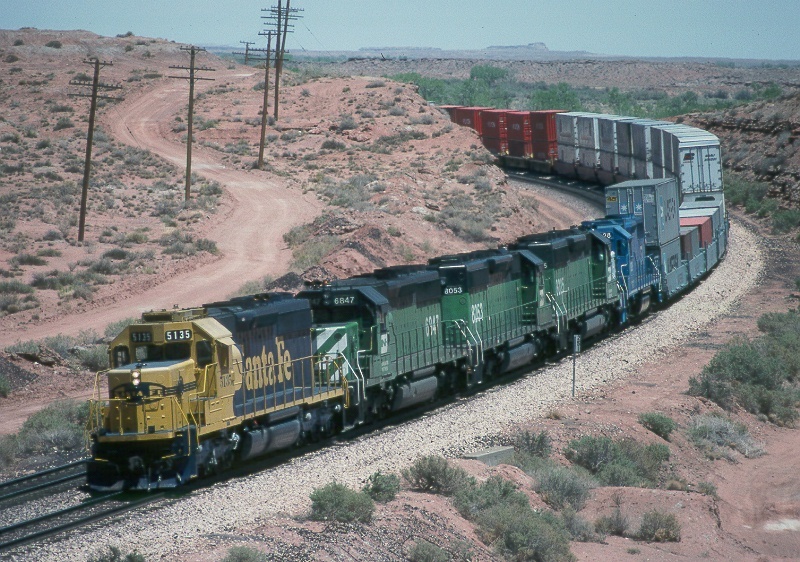 Here is a westbound at Holbrook on May 13, 1990. 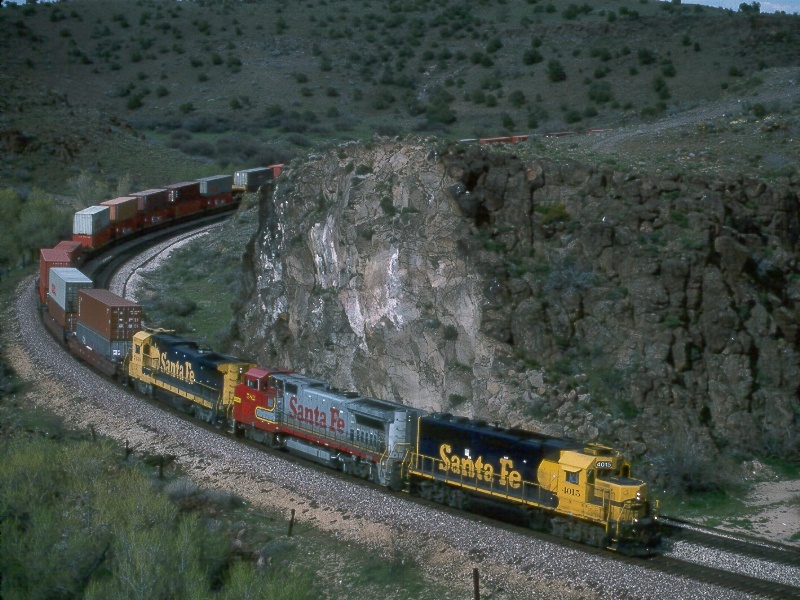 This westbound train is just cresting the summit of the Arizona Divide at an elevation of 7335 ft on June 23, 1990. 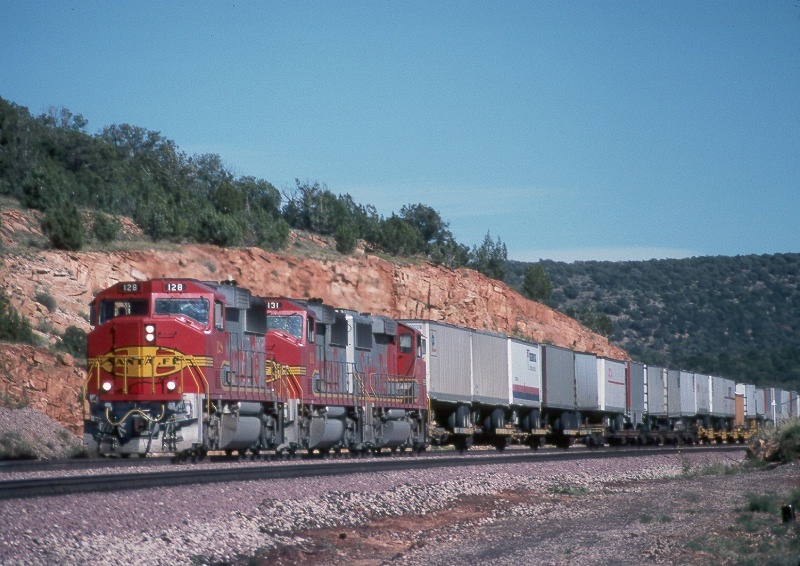 This westbound has just passed under I-40 near the Arizona Divide on June 23, 1990. 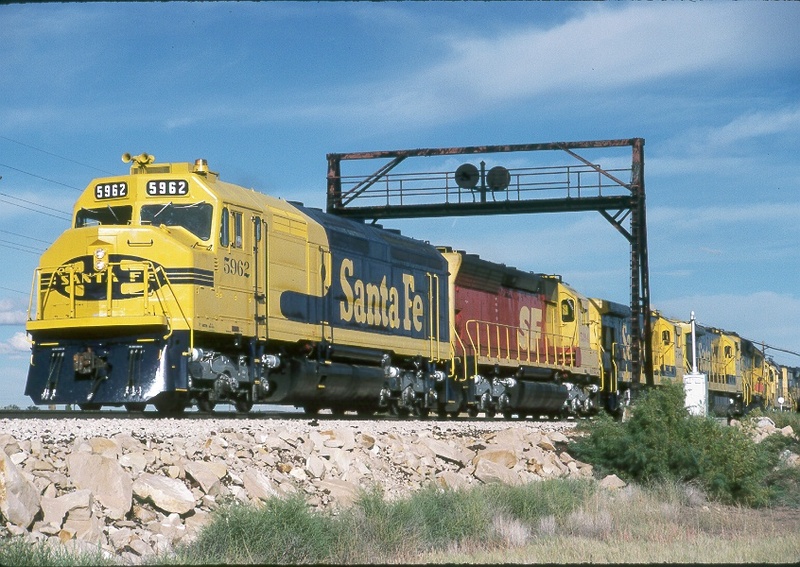 The Santa Fe sure had some varied consists - where else will you find a GP20 leading a SD45-2? This was the only time I got all three paint schemes on one train. This one is near the Arizona Divide headed west on Aug. 26, 1990. .This was my first shot of the new GP60's in the 100 series. 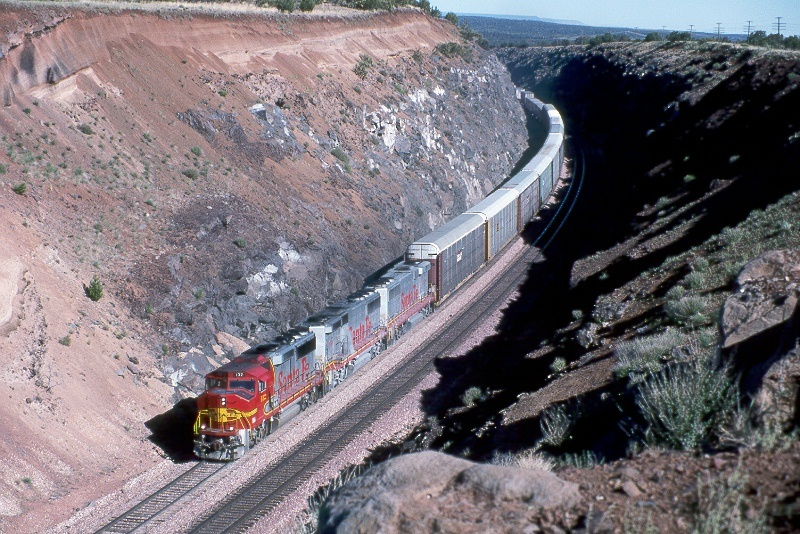 Shown here westbound at a high rate of speed near East Eagle Nest on Aug. 25, 1990. 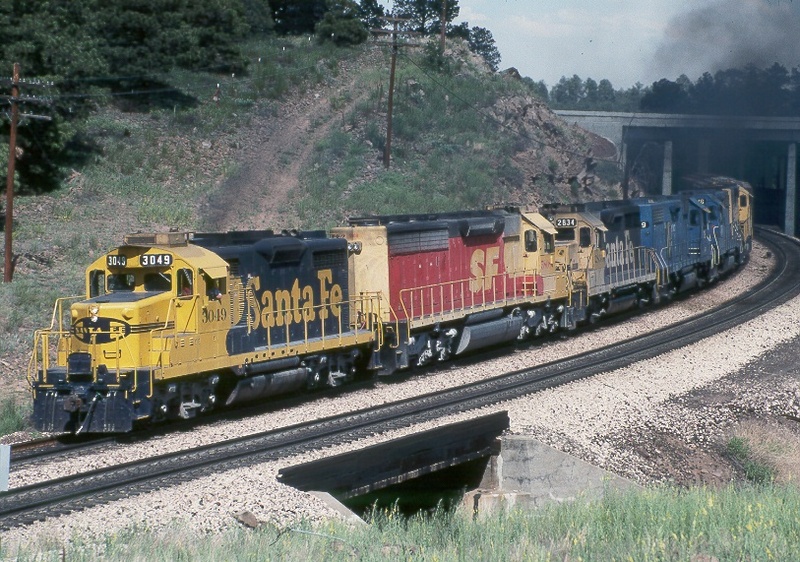 Late in the evening of Aug. 25, 1990 is this consist of 3 SD45's near West DoubleA. A freshly painted GP30 glistens in the late afternoon sun at Williams Jct. 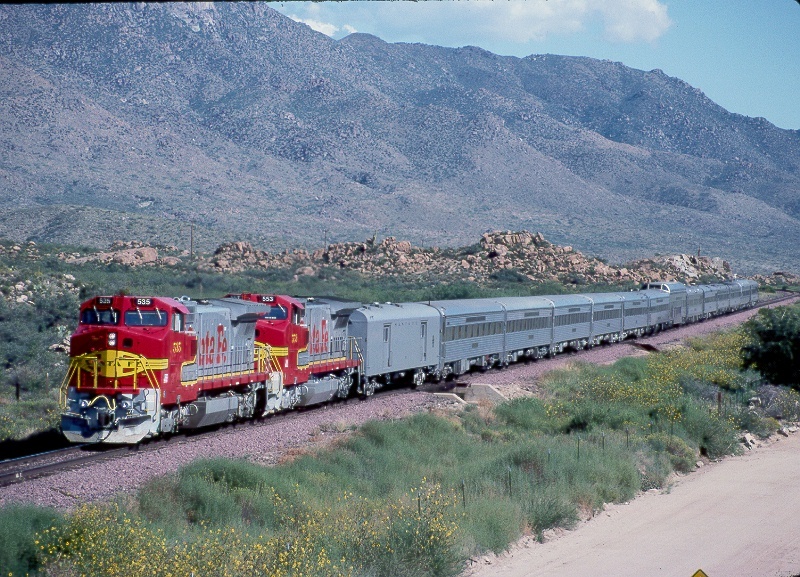 on Sept. 27, 1990 as it heads onto the Peavine southbound towards Phoenix. 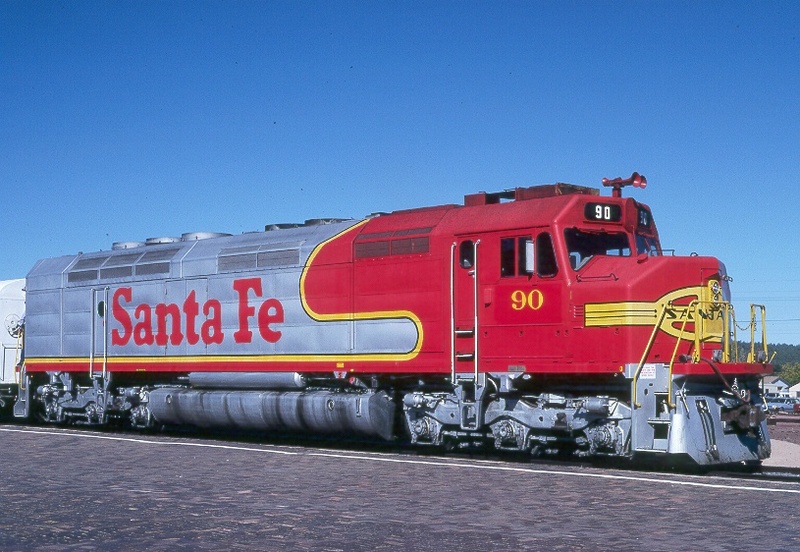 This is the class unit for the FP45's on display at Williams for the Grand Canyon Railway's First Annual Railfan Weekend on Sept. 29, 1990. 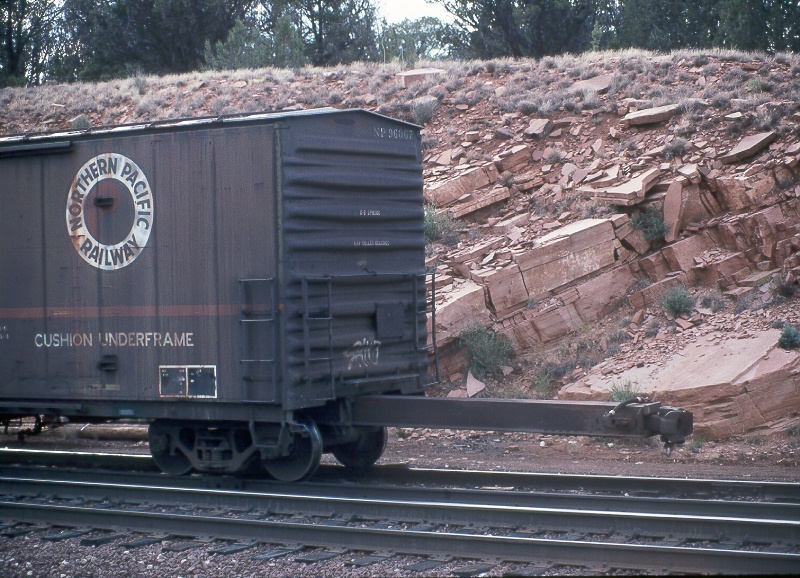 Also on display was a converted baggage car with exhibits about the Santa Fe. During the long daylight hours of summertime, the big cut at East Perrin is one of my favorite morning spots. Here is an eastbound around 8am on July 27, 1991. 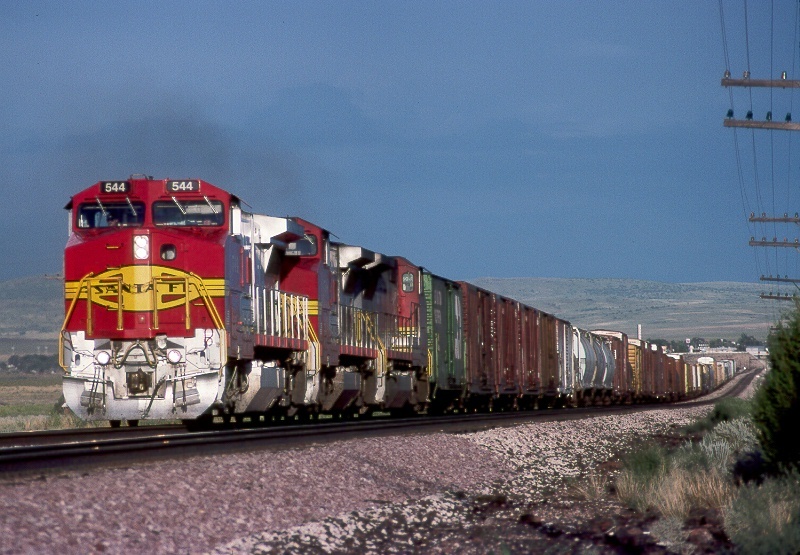 Here is a almost new GP60B on an eastbound train at East Perrin on July 27, 1991. A nice view for modeling. 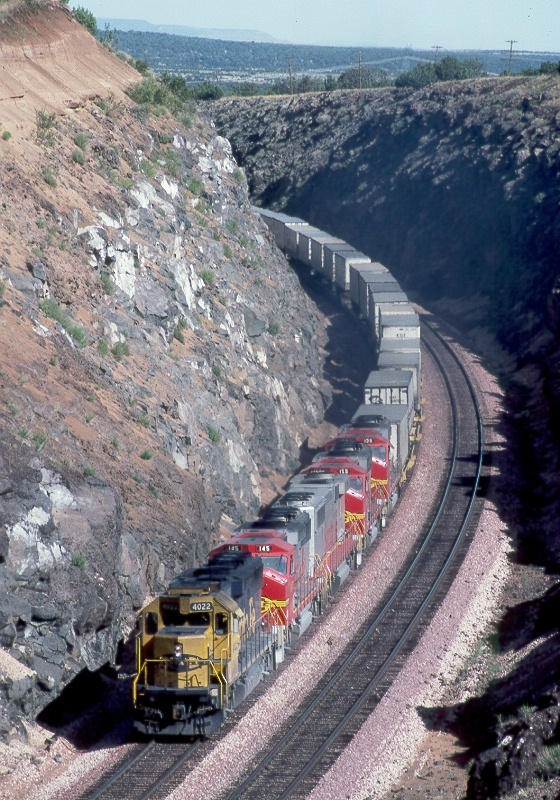 This is a southbound (railroad west) train on the upper horseshoe curve on the Peavine, just a few miles out of Williams on July 27, 1991. 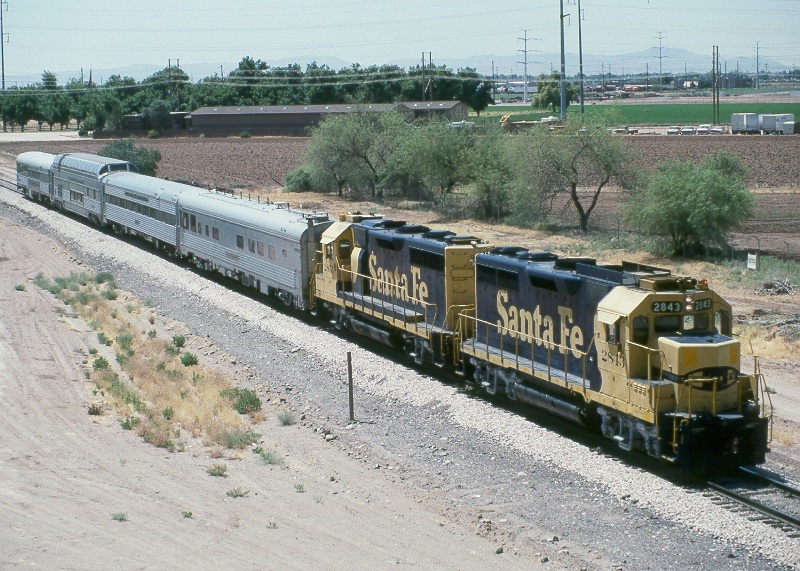 This is a Santa Fe business train headed north (railroad east) on the Peavine branch at Peidmont on Sept. 25, 1991. A nice clean A-B-A-A set of GP60's is climbing the hill into Yampai on Aug. 30, 1992. 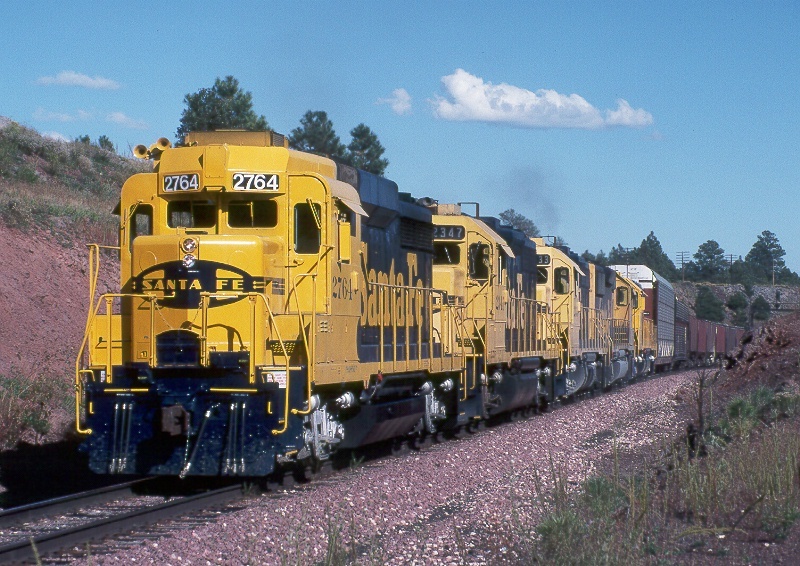 This late afternoon westbound is at Seligman on Aug. 30, 1992 as monsoon storm clouds build to the east. 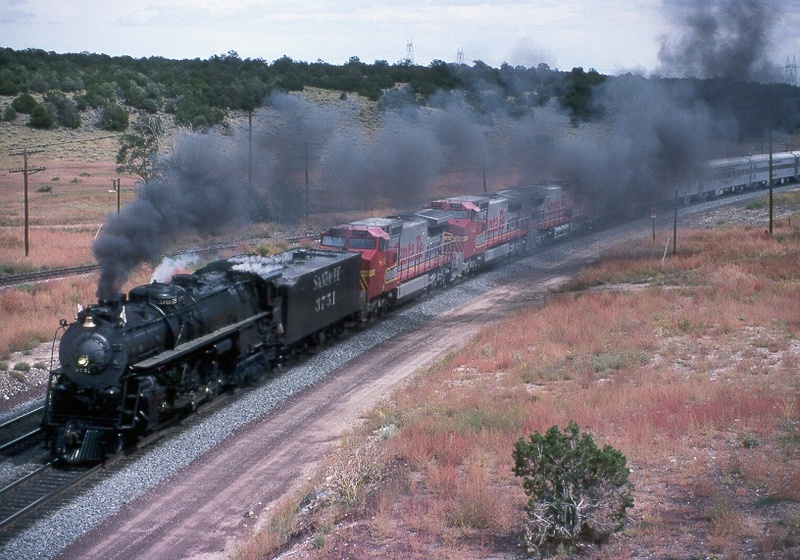 Here is the famous 3751 steamer charging uphill eastbound through the signal bridges at West DoubleA on Aug. 31, 1992. 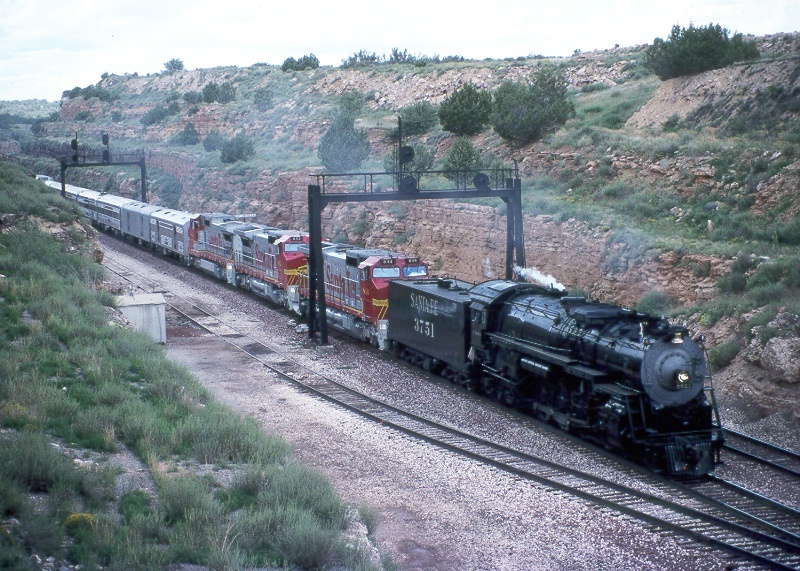 On the return trip of the 3751 to California I got this shot at Darling, just east of Flagstaff on Sept. 15, 1992. 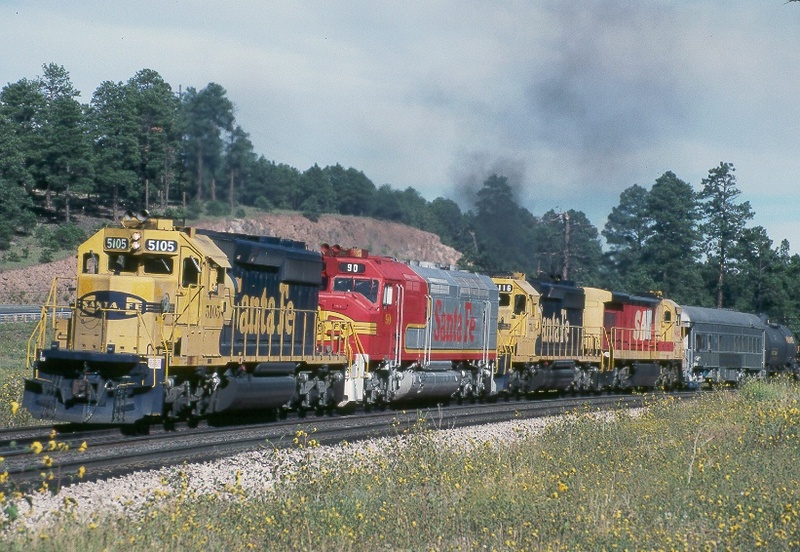 A nice clean A-B-B set of GP60's is pulling upgrade at East Perrin on July 25, 1993. Modeler's take note! Here is a really long cushion drawbar....actually the drawbar has been pulled out from under this old NP box car. Shown here at West Eagle Nest on July 23, 1994. This shot was taken very early on the morning of July 24, 1994 at East Eagle Nest. 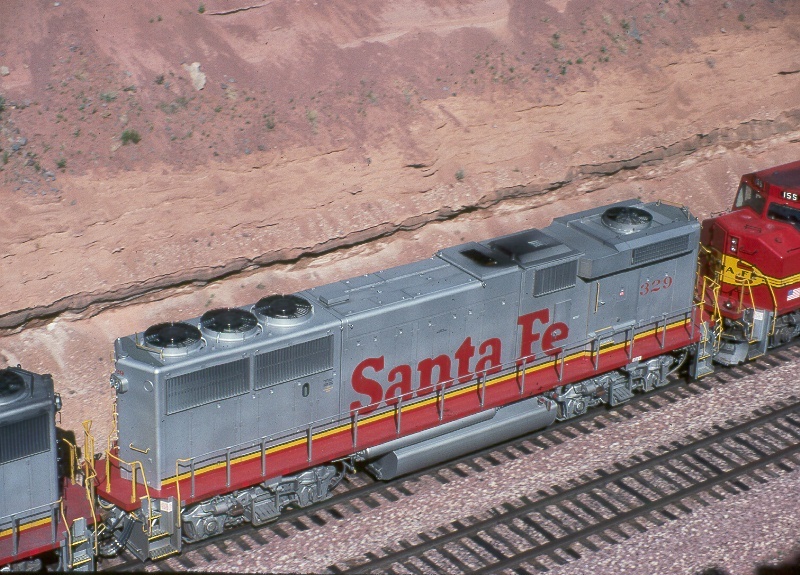 The clean Warbonnet colors really stand out in the pristine clear air. 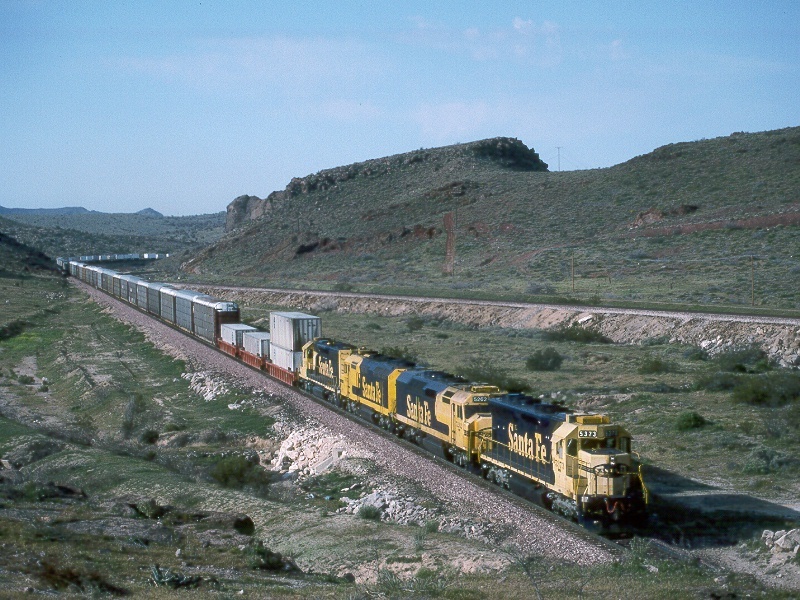 Here is a westbound going through Crozier Canyon on April 1, 1995. This canyon is quite short, but it is really scenic and there are a lot of photo spots. 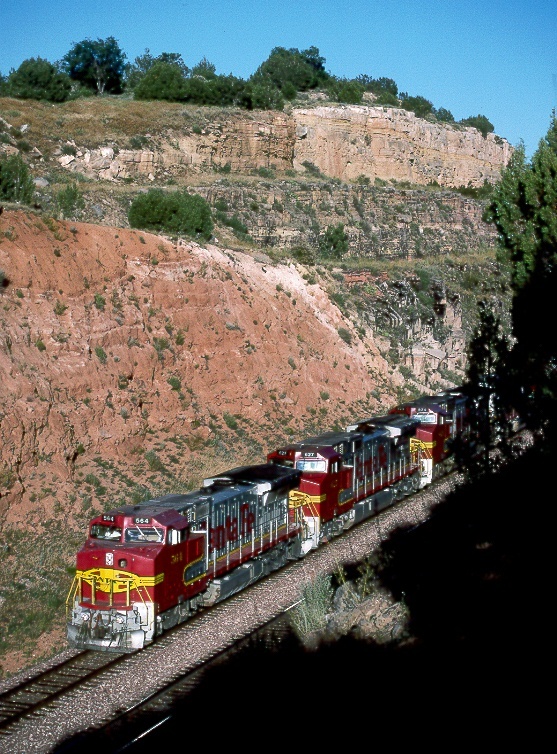 This early morning eastbound is just leaving Kingman Canyon on April 2, 1995. The westbound track is in the background. 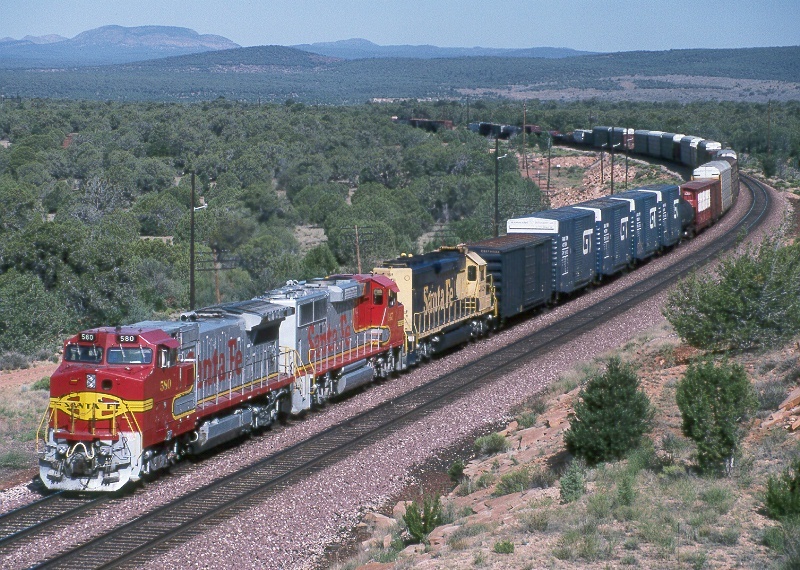 On July 22, 1995 I got this westbound in the late afternoon going through the big cut at West DoubleA, Arizona. Really nice low sun angle! 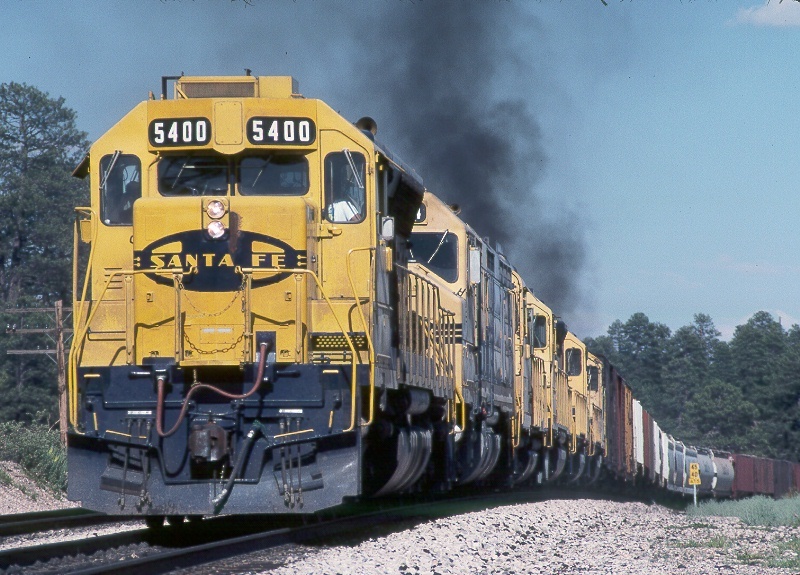 Here is a photo of things to come with the BNSF merger underway. 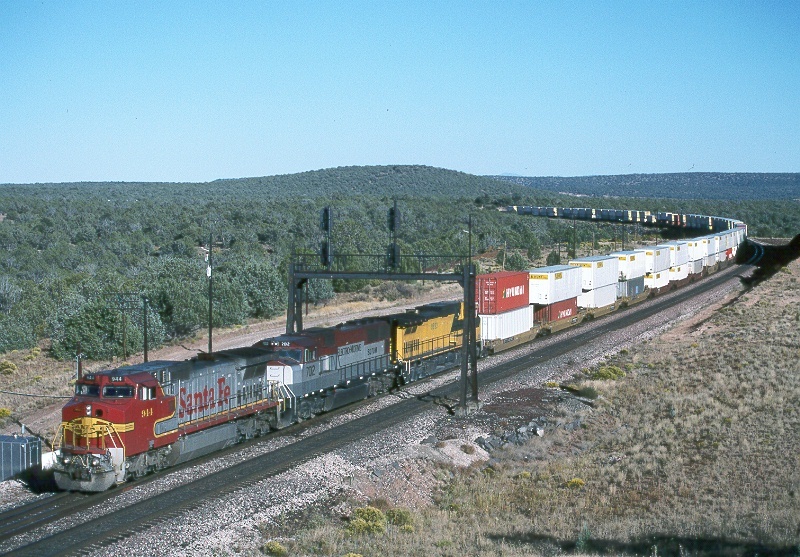 This westbound is at West Eagle Nest, Arizona on Oct. 14, 1995. Late on the afternoon of Oct. 14, 1995 I got this westbound at the East Eagle Nest crossovers. These signal bridges are now being replaced with tri-lights. This Web Page and all photos on it are copyright ©1998-2001 by Ted Ellis. All Rights Reserved.